Ominous clouds form in the distance. The sunny sky slowly turns grey. There is a sweet smell of fresh rain on hot pavement. Then the downpour ensues. ddddled under a small overhang are 11 ecologists trying to stay dry while the storm subsides so they can board their boat for Pongara National Park. Pongara is one of the protected national areas located south of Gabon’s capital, Libreville. The park covers a large area with some of the tallest mangrove forests in the world. Besides being one of the tallest mangrove forests, the park itself is also highly protected and boasts a thriving fishing economy. The science team is interested in mangrove forests because they are extremely important for coastal communities. They provide protection from storm surge, habitat for fish and birds, wood for timber and charcoal, and help to store large amounts of carbon in their soils. The team huddled under the awning are part of an international group of ecologists working on a project funded by NASA. I am one of them. Our work serves to use the full range of NASA satellite observations, modeling/analysis capabilities, and commercial off-the-shelf technologies to establish the accuracy, quantitative uncertainties, and utility of data products for supporting earth monitoring frameworks. In particular, our team’s strategy is to use 3D mapping techniques to quantitatively characterize mangrove forest structure, extent, and change over time by linking remote sensing and field-based measurements. Dr. Fatoyinbo, PI for the project, leads the way in measuring mangrove forest structure in Africa and other parts of the world using radar and lidar sensors. Our work for this project is to characterize the 3D structure of mangrove forests and how it changes over time, which is important for protecting and properly managing coastal areas. Dr. Lee, a member of the science field crew, has been modeling forest structure using TanDEM-X imagery. Recently, he completed a canopy height model for Pongara. The tallest areas of mangroves reached almost 60 m. Using lidar and radar data collected during a separate AfriSAR campaign, last year, canopy height was also estimated to reach 60 meters (197 feet) in height. 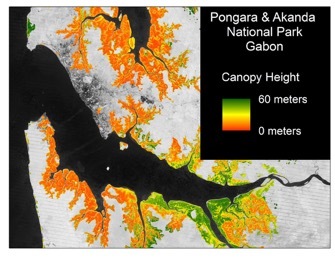 Canopy height model for Pongara and Akanda National Parks in Gabon. The canopy height models are generated from radar satellites. The damp scientists waiting for the boat were on a mission to measure individual trees in the mangrove forests to validate our remote sensing models. Gabon is one of three countries in Africa we are studying. The mangrove forests in Pongara National Park are very different to other mangrove forests we have measured in Tanzania and Mozambique. In Pongara, the forests are dominated by only two species, both of which are in the genus Rhizophora. This genus of mangrove trees has the characteristic prop root structure. Part of the work we are doing in Gabon will help us to compare and contrast mangrove forest structures across geographic regions. In the process of collecting ground information to validate our remote sensing models, we are also trying to characterize the different types of mangrove forest structures across Pongara. Because of the similarity in species across the range of brackish water conditions, we will be able to compare the carbon storage capacity in freshwater and saltwater areas with the same types of trees. The canopy height models we have developed for the area were separated into three groups: short, medium, and tall. Short mangrove site (left); medium mangrove site (middle); and tall mangrove site (right). In order to make these comparisons, we needed to collect detailed information about the size of the tree and the material in the soils. To do this, we measured the diameter and height of every tree in a given area. This type of information is useful to determine the amount of aboveground biomass. We also collected three soil cores from each site to provide us information about the belowground biomass. Dr. Trettin, from the US Forest Service, has been the mastermind behind the field campaigns and field data analyses. (Left) Nathan-JPL measuring tree height. (Right) Carl-USFS showing the students how to collect a soil core. In addition to the traditional forestry surveys, we also collected digital information to help model the 3D structure of the forest with the help of lasers and cameras. Atticus Stovall, a PhD student at the University of Virginia, operated a Terrestrial Laser Scanner (TLS), while I collected data using TR33S (Terrestrial Recording of 3D 360 Surveys), an instrument concept funded by USRA. The TLS sends out laser pulses that are reflected off objects and returned to the sensor. The return time of that laser pulse provide information about the distance of the object. Combining billions of laser pulses together, we can then reconstruct a point-cloud of what the forest looks like (see below). Preliminary 3D model of the tall mangrove forest collected by the TLS and Atticus Stoval. On this campaign we were also testing a new instrument. TR33S collects pictures in every direction using a plurality of cameras. It therefore, has the capacity to provide compelling 360 photos of the forest so it feels like you are there, and create 3D models using structure-from-motion (SfM). SfM is a photogrammetric technique that can model a 3D space from 2D images. Both of these technologies, TR33S and TLS, are not new, but very little work has been done to use these methods in coastal settings. The use of these instruments will allow us to “see through the canopy”, something where our airborne and satellite measurements cannot. Terrestrial Recording of 360 3D Surveys (TR33S) instrument (left); example of unique mangrove prop root system (middle); and structure-from-Motion 3D reconstruction of mangrove roots (right). 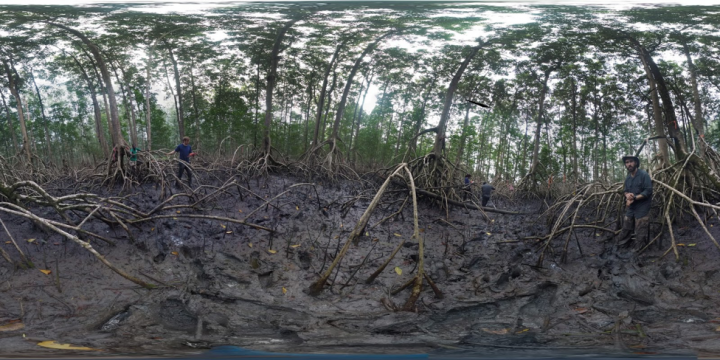 A 360 view of one of the tall mangrove forests. The tallest trees in this picture reach over 30m (98ft). If you look around you can see different parts of the field crew measuring tree diameter and collecting soil cores. Explore the 360 view here. Students from Omar Bongo University accompanied us on our campaign and were excited to work with our crew. The students were undergraduate and graduate students in the Department of Geography. Our close collaboration with the faculty helped us to organize the students that wanted to help. During our campaign they were extremely curious; asking us questions about remote sensing, soils, mangroves, and 3D modeling. Almost every night at the camp site, one of the science team members would hold “class” for the students. One night I went over SfM techniques and showed a few of the students how to use pictures to model 3D structures. In this case, it was of the field crew (see below). When class was not in session, the field crew would be playing a game of Uno with the some of the local villagers. The field days were long, so it was nice to wind down at the end of the day. 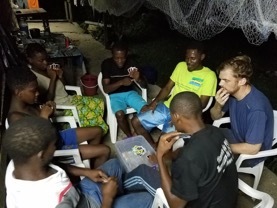 To help relax at night the team would play Uno, with integrated english-french speaking lessons.